Awesome wings and nachosRelaxed barBest wings. A true dive bar with good food and a decent beer selection. The Cajun nachos were incredible. Wings were great. I loved the Hoisin Poison ( CAROLINA Reaper) but my sweet husband almost passed out. Good times. We will be back. Thanks Mila! The food was very good for bar food. The fried cheese was very good....better than the typical mozzarella sticks. We enjoyed visiting together before taking off on our flight. Some locals had their dogs in there, which added some pet therapy. this is a treat. this is perfect americana. i request people try the Bee Stings. Never had anything like this. will be back soon. Don't like the music, too bad! Stopped in for beers, so far so good. Got beers, so far so good. Asked about changing music and was told, "this is what we're listening to tonight." Check please. Lost four customers in one sentence. One of my favorite old haunts, and locally owned. The place is iconic (as is Chris, the owner, a former pro fighter). Best wings I've had outside of Buffalo/Western NY. They've got the awards to prove it. 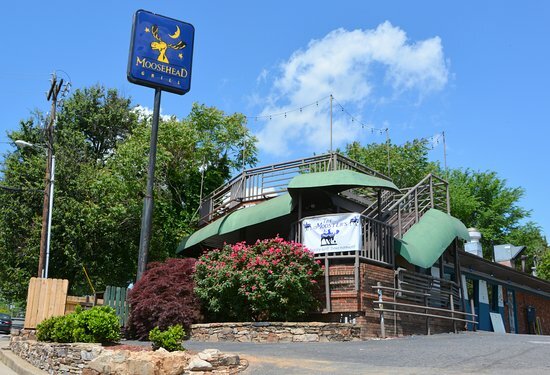 Get quick answers from Moosehead Grill staff and past visitors.